Emagic has posted a beta version 3.1b2 of SoundDiver, a universal editor and librarian program which supports many MIDI devices. This is trial, pre-release, time-limited software meant for evaluation purposes only. this software should not be used in a commercial operating environment or with important data. before installing this emagic software, you should back up all of your data and regularly back up data while using this emagic software. 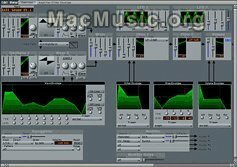 Info about SoundDiver is available on MacMusic Softwares section.